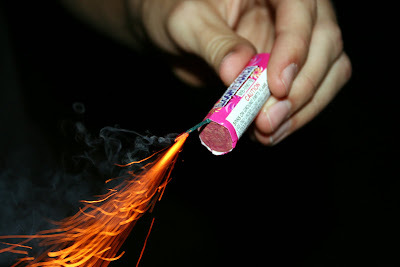 Backyard fireworks are illegal. Please do not travel the convenient 45 minute drive from Granada Hills to the enchanting town of to Fillmore, home of many verdant farms, fruit stands, and this time of year, plentiful safe 'n' sane fireworks that are sold to support organizations like the Vernon Police Officers Benefit, Rotary Club, AYSO, and Future Farmers of America. You also should not travel to the El Monte area, stopping for lunch in nearby Pasadena's Old Town shopping district, to buy fireworks. It is illegal. Drive around at night on any area freeway on Independence Day, and you'll see random explosions going off in the sky all over the place. It's cool. It's a straight shot on the 118 from GH to Moorpark, which is just past Simi Valley, where the city hosts a big fireworks show on July third -- leaving you free to enjoy the official holiday the following day. The event is in Moorpark's annual Fireworks Extravaganza begins at 4 p.m. at Arroyo Vista Community Park, 4550 Tierra Rejada Road. There will be a vintage plan fly-over, sky divers, kettle corn, sack races, and all sorts of wholesome American family fun. Actual fireworks happen a little after 9:00. These people do a fireworks show every night in summer, so it's safe to say they've got it totally dialed in. I went two weeks ago, and it was one of the best shows I've seen. Best viewing areas are next to Small World, where the pyrotechnics are coupled with images projected on the walls of the ride, and the rooftop of Disneyland's parking structure. For driving convenience, you can't beat this local mega-church's 21-minute show, located at 19700 Rinaldi Street in Porter Ranch, conveniently located across the street from Wal-Mart. Get there early; the streets and sidewalks all around the event get crowded and nearby parking is nigh well impossible, barring an act of God. The best strategy would include bikes.